Albufeira on Facebook - lots of pictures! Albufeira Bus Station is a mile/1.6km outside the centre of the town in the Caliços area. Please read on. The Albufeira Bus Station is 1 mile/1.6km from the old town! Almost all buses* to and from ALBUFEIRA end or start here. Many do not go anywhere near the old town centre and beaches. Map of Albufeira showing bus station and various town districts. Map here to show you 'how far' from old town and strip. (* the only exception is the Frota Azul bus to and from Messines, Algoz, Guia and Páteo which goes via the Bus Station on its way to and from Areais São João (the strip). Distances from the Bus Station (by road) which is why you might need a a local bus or taxi to get to your final destination. There are usually taxis at the Bus Station. If you need one phone 289 583 230. Official Albufeira taxi website with fares etc here but is far from comprehensive. Albufeira Bus Station has a covered waiting area and café/bar. There are nineteen different bus stops, clearly labelled with the routes and destinations. There are however no maps to show where the buses go nor any timetables, except those on the noticeboard inside. THE LOCAL 'GIRO' BUS ROUTES ARE COMPLICATED AT FIRST SIGHT AS THEY DOUBLE BACK AND GO ROUND VARIOUS LOOPS. 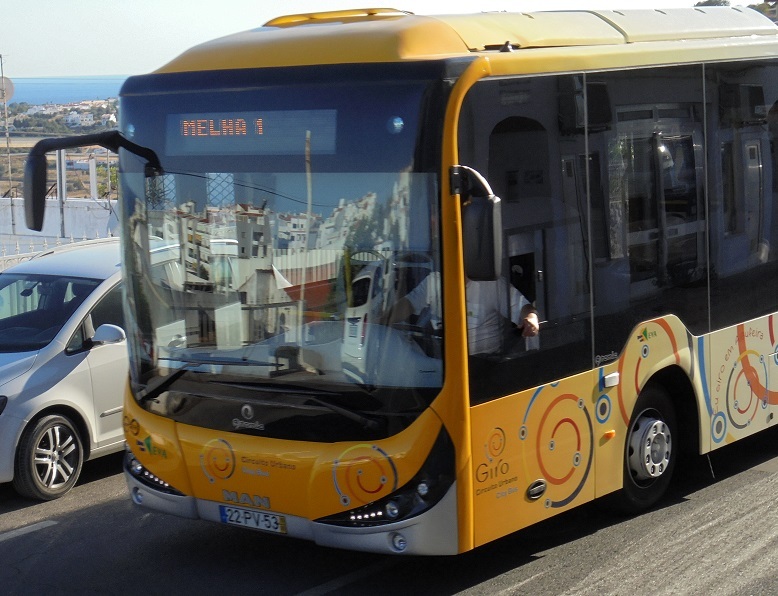 The official GIRO bus map for Albufeira's town buses is here - external link opens a new window. There are other maps here. The council has splashed out on some new 32 seat buses. New Bus exterior - click to see full size. These buses have a ramp at the centre doors for wheelchairs and buggies. Fifteen seat minibuses are now being used on some journeys on weekdays and many journeys at weekends. These have a wheelchair and buggy space at the back with a ramp. Click for large size. The local GIRO bus network connects the Bus Station, the old town and other districts of Albufeira. SUMMER times on the GIRO network apply from 1st June to 30th September. Buses on four routes, Vermelha (Red 01 and 02), Verde(Green) ,Azul (Blue) all leave at the Bus Station at the same times, on the hour and on the half hour. The Laranja route buses to Ferreiras and the station leave at about 10 and 40 minutes past the hour. They run seven days a week (including holidays) at the same times. Except for Laranja, first buses leave at 0700, with last buses from the Bus Station at 1900 during the winter and 2100 during the summer. Buses run only once an hour after 1400 on Saturdays, all day on Sundays and Holidays, except on Linha Laranja to Ferreiras which runs every 30 minutes all day, every day. First bus on Linha Laranja, to Ferreiras and the railway station, leaves the bus station at 0640am then every 30 minutes until 2040hrs (winter) 2240hrs (summer). Cash fare is €1,40 valid for one journey. Pay on boarding if you do not have a pass or one day ticket. Single tickets are valid for one hour after first issue. You can use it to change to another GIRO bus to complete your trip. If you are asked to change buses at the bus station, show your ticket to the second driver. You do not pay again. A one-day ticket costing €4,00 is available on board buses. For irregular users, a plastic pre-pay card (€3) is available which can be loaded with ten rides for 8 Euros or twenty rides for 16 Euros i.e. 80 cents each. Pre-pay cards will de-activate if not used for three months. Adding more credit will re-activate them. The cost of the pre-pay card (3 Euros) is refunded if you hand it back, but unused fares are not refunded. Monthly passes are also available, photo ID required. 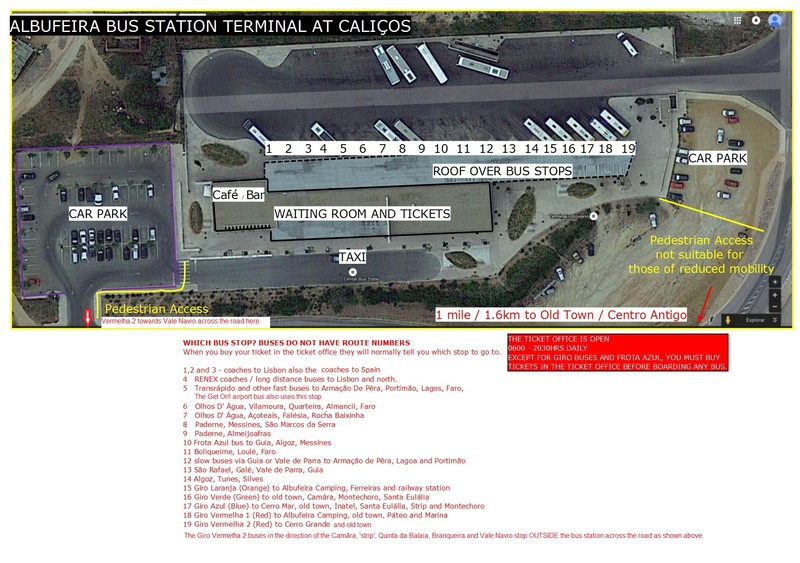 Passes are sold only at the Bus Station, or at the Bus Shop in the town. It is rumoured that some hotels may have a stock!There are no discounts for seniors or children except residents. Official route map - external link. You can save this to your own device. Printed copies of this map can be obtained at the bus station or the bus shop in town. The map will open in a new window. Official timetables are NOT published. Please take a look at my timetables, which have been compiled after many journeys of exploration by myself and others! These do not list all the stops for reasons of brevity, but I have a link to the official diagrams showing all stops. There are GIRO route maps at many, but not all, bus stops - here's a picture - but still no actual timetables! The LINHA VERMELHA Giro 1 (RED) route (timetable here) runs around the west side of town from the main bus terminal to Albufeira Camping, down to the old town at Av. Da Liberdade, then to Páteo and Vale Santa Maria, back through Páteo, then down to Varzea da Orada and the Marina then back up the hill via Cerro Grande to the old town, then to the Cámara and back to the main Bus Station. In its meanderings it does stop at some places twice. Also, four buses each day make an extra stop down in the Marina near the entrance to the fishing harbour. The LINHA VERMELHA Giro 2 (DARK RED, a sort of plum colour really) (timetable here), runs as follows: Bus Terminal, Health Centre, Dolphins Roundabout, Cerro Grande, the old town at Ave. da Liberdade, then straight back to the Health Centre, past the Bus Station (stops outside, across the road! ), then to the Câmara, Continente Modelo shops, Areais São João (The Strip), Bullring, Globes Roundabout, Quinta da Balaia, Branqueira village and the Vale Navio roundabout, then back to the Bus Station along the main road via Areais São João, the 'Worms' roundabout and Modelo. The maps do show this a bit better. The red routes are often delayed in the summer, when traffic clogs the Avenida Da Liberdade in vain efforts to find a parking space. 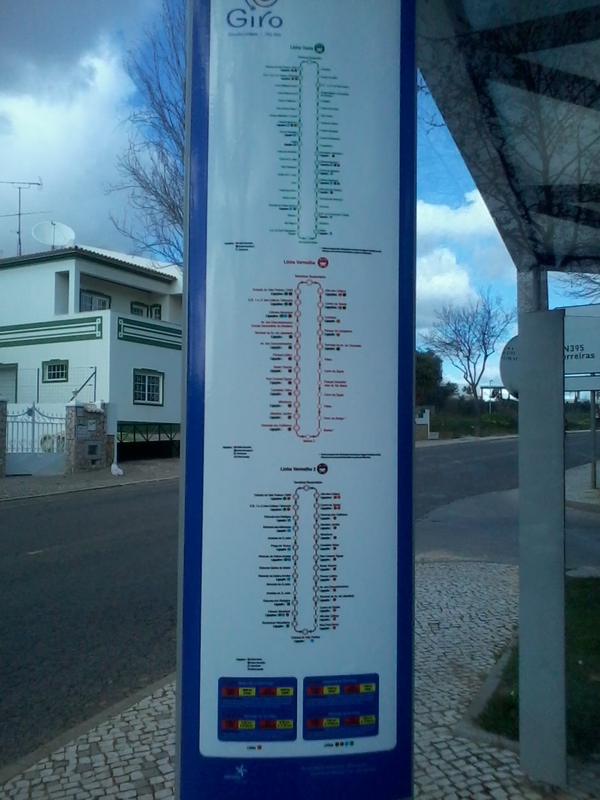 The LINNHA VERDE (GREEN) route (timetable here) runs a clockwise route to the Vale das Pedras, Stadium, Câmara, Old Town (Rua Alves Correia), back to the Câmara, then along to Continente Modelo shops, Montechoro, Brejos, Globes Roundabout, Santa Eulália, Oura, Inatel, Câmara again, Old Town (Rua Alves Correia), Cerro Malpique and back to the Bus Station. The LINHA AZUL (BLUE) route (timetable here) is the same as the green route (more or less) but in the opposite, anti-clockwise, direction. The LINHA LARANJA (ORANGE) (timetable here) route runs between the Bus Station and Albufeira Railway Station via Camping Albufeira, Ferreiras and Vale Serves. The BLUE route is the shortest way from the Bus Station to the Old Town. It will take you to the Rua Alves Correia, which is near the square and the 'Fishermen's Beach' area. The RED GIRO 01 route goes a rather roundabout way from the Bus Station to the old town centre (Avenida da Liberdade) about 200 metres from the square. On your way back to the Bus Station, the RED GIRO 02 route from the Avenida Da Liberdade is the quickest, but stops OUTSIDE the Bus Station across the road. The RED GIRO 01 route goes a longer way round but goes inside. The GREEN route runs from Rua Alves Correia to the Bus Station via Cerro Mar. 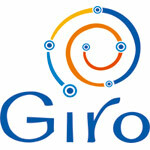 SUMMER times on the GIRO network apply from 1st June to 30th September. All routes operate seven days a week, all holidays included. Buses leave at these minutes past every hour on weekdays and Saturday mornings. On Saturday afternoons after 1400hrs, also all day Sundays and Holidays only the buses marked in bold will run. THE LINHA LARANJA (ORANGE ROUTE) TO FERREIRAS AND THE RAILWAY STATION STARTS FROM THE BUS STATION AND DOES NOT SERVE THE OLD TOWN. BUSES LEAVE AT 10 AND 40 MINUTES PAST EACH HOUR. LAST BUS TO FERREIRAS LEAVES THE BUS STATION AT 2040 IN WINTER, 2240 IN SUMMER. * this is behind the multi-storey car park and the tall chimney. At this stop, buses on the Linha Verde (Green) route go at more or less the same times in both directions, so make sure you get on the right one! ARRIVING IN ALBUFEIRA FROM OTHER TOWNS? LEAVING ALBUFEIRA FOR A VISIT SOMEWHERE? Of the local bus routes, only the Albufeira town's GIRO buses go down into the ‘Old Town’ area – Centro Antigo. For many destinations you must go to the main bus station. Except, depending on where you may be staying, you may not have to go to the Bus Station if travelling to/from Guia, Galé, Loulé, Olhos D'Agua, Vilamoura or Quarteira. Buses to other towns, except for one route, are run by the EVA bus company, whose official website is here. I have a summary of the main places you can get to here with links to detailed timetables. Timetables are posted on the noticeboard, copies can be obtained from the ticket/enquiry office. There is no map of routes either on the official websites, at the bus station nor is one printed. 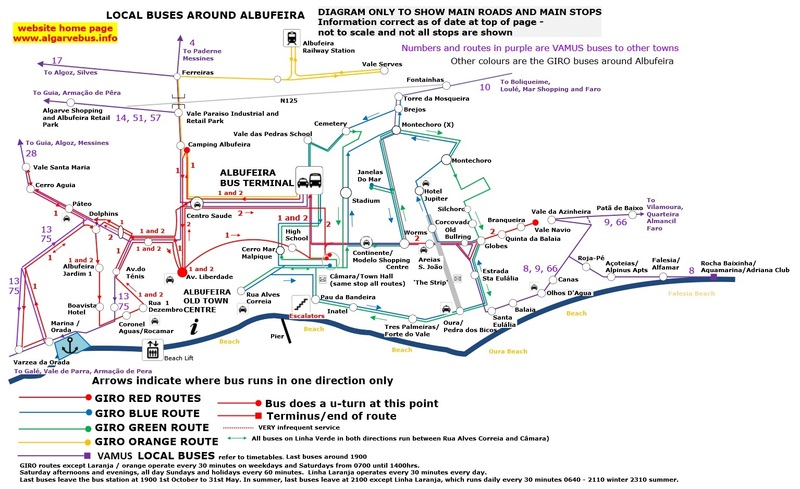 For my map of Algarve bus routes, please click here. The electronic destination boards do not show all departures, only those to ‘important’ places! There are separate enquiry and ticket offices for local and long-distance bus services. Remember that, if boarding at the Bus Station and except for GIRO and Frota Azul buses, you are supposed to buy your ticket at the ticket office. Some drivers are very strict about this! The fast TRANSRÁPIDO buses to and from Faro and all fast buses to and from Lagos, Alvor, Praia da Rocha, Portimão, Lagoa, Armação de Pera, Guia and Faro STOP ONLY AT THE MAIN BUS STATION - nowhere else! The old town is basically a pedestrian zone, with limited access for residents and those important beer deliveries. There are car parks on the edge of the area, but the closer you get the earlier they fill up. During high summer season, most of the town centre car parks, including the two multi-storey, are full by 9am so you may end up parking a fair way out and having to take a bus into town and back up the hill afterwards. The surface car park at the top of the Avenida Liberdade (marked on the map below) is paying parking area. There are spaces during the day in high season, as locals baulk at paying the €5 fee, but it is full on summer evenings. The multistorey car park opposite is open only in summertime. If you are coming into or leaving Albufeira on the Transrápido or the Lagos - Albufeira fast buses, the Bus Station is the only place they stop. You might need another bus or taxi as an alternative to a long walk to your final destination. Buses from Vilamoura, Olhos D'Agua and Balaia stop opposite the Continente Modelo supermarket a few minutes walk into town - see above and the map below. If you are coming into town on an ‘ordinary’ bus from the north (eg Ferreiras, Guia or Silves) these buses stop at the Centro de Saúde (health centre) before the Bus Station. That is much closer to the old town than the Bus Station, about 7 or 8 minutes walk along the flat footpath into town. This goes under the main road in a tunnel, so is quite safe. GOING TO /COMING FROM VILAMOURA, QUARTEIRA, FARO? ALSO GALÉ, GUIA, SILVES OR LOULÉ? YOU MAY NOT HAVE TO GO ALL THE WAY TO THE BUS STATION. The buses to and from Loulé stop along the Estrada Vale das Pedras, which runs to the north of Montechoro. There is a stop called Montechoro (X) or Crossroads up near the roundabout where the road leads off towards Fontainhas. The GIRO buses stop there also; they call the stop Montechoro Norte. Using that stop will save you a long walk if you are staying in that area and wish to go to Loulé. See map. Buses to and from Galé and also the very infrequent local buses via Vale de Parra stop at the Health Centre (Centro de Saúde) and on the edge of the old town. Outbound buses stop in Avenida do Ténis outside the Escola Primaria - Junior School. Inbound buses stop on Rua Coronel Aguas and also on Rua 1 Dezembro near Merlins Bar. Buses to and from Silves also stop at the Health Centre (Centro de Saúde) and outside Albufeira Camping. 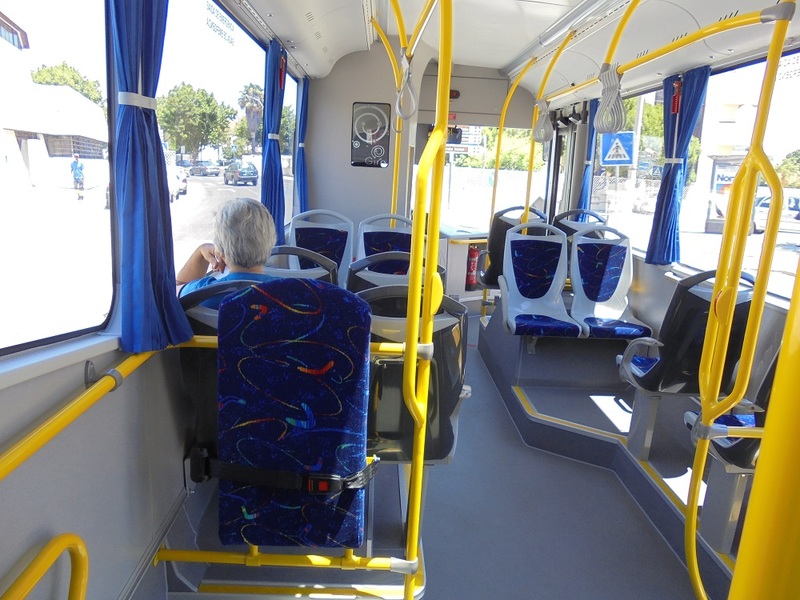 The FROTA AZUL bus between Messines, Algoz, Guia and Albufeira also stops at Modelo and Areias São João, close to 'the Strip', also near the old town on the main road and in Páteo. EVA's buses to and from Guia stop at the Health Centre (Centro de Saúde) and outside Albufeira Camping but are very infrequent. The fast buses (Transrápido and Linha Littoral) do not stop anywhere except the main bus station. 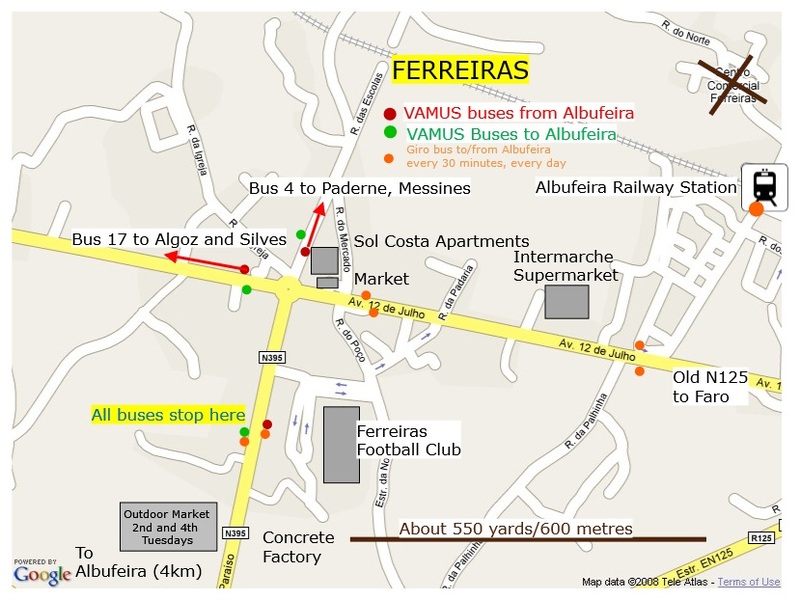 Click here for a map showing all the EVA and Frota Azul bus stops in and around Albufeira. The tourist train also stops at the Tres Palmeiras roundabout outside the Forte do Vale hotel between the 'strip' and the old town. This is one of those little things disguised as a train but is in fact a ‘road train’. It runs between in one direction only between Areias São João (the stop is just off the top end of the ‘The Strip’ in Rua Julio Diniz, across the road from Vila Nova), via a stop at the Tres Palmeiras roundabout outside the Forte do Vale hotel, to the Pau da Bandeira (top of the escalators), then up to the Brisa Sol Hotel and then back to Areias São João. The two central stops are marked T on the map above. It stops only at these places and does provide a useful direct link between the old town area and São João. Timetable : Operates every 20 minutes from about 0900 until about 0100 from 1st June to 30th September otherwise until 2300 . In winter, they run only every 40 minutes after 1800hrs. On New Year's Eve it runs until 0400 and on August 20th (Albufeira Municipal Holiday) service also runs until 0400. Timetables are clearly displayed at the stops. Fare is €2.50 for a single ride (children age 6 to 11 or those over 65 pay €2.00); €4.00 (€3.00 children and seniors etc) for a day pass with unlimited rides. This is not a public transport option as such. It costs €18 for one day's travel, €35 for 4 days. Children 12 and under travel half price. However, if you are in somewhere like Salgados, São Rafael or Galé, where normal bus service is very limited, you might find this option more economical than using taxis every day. Visit their website for maps and more information. There is no proper timetable published anywhere, but buses run every every 30 minutes in summer, 60 minutes in winter. Service in summer (July to October) is from 0930 - 1900hrs, in winter last journeys are at around 1600hrs. According to their website there is no service in December nor from 1st to 15th January. Albufeira outdoor market (first and third Tuesdays of the month, mornings) is held just around the corner from the Bus Station in Estrada Vale das Pedras. Parking nearby is very difficult on market days so, unless you are planning to buy something huge, the bus will suit. There are two parking areas for maybe 300 cars in all, one by the Bus Station about 100 yards from the market entrance and another one on the other side of the Bus Station about 250 metres away from the market. You can also park on the road that leads towards the swimming pool - if you get there early enough. Ferreiras outdoor market (a smaller version of the Albufeira one) is held on the 2nd and 4th Tuesdays of the month. This is on the N395 road, just to the south of the village centre opposite the concrete works. All buses serving Ferreiras stop about 150 metres away. Map. Albufeira Marina is on the western edge of town about a mile/1.6km from the old town centre and about two miles/3.2km from Areias São João. The Marina is served from the old town (Avenida da Liberdade) by the GIRO 1 red route, which costs €1.40. In winter, the last bus to the Marina leaves Old Town at 1915 and from the Marina up the hill into town the last bus is at 1930. In summer (1st June to 30th September) buses go down to the marina until 2115, last bus back up is at 2130. Algarve Shopping website has some pages in English. The Albufeira Retail Park (with Iceland's store) is adjacent,but there is now a fence around the site and the only walking route is right around the back of Algarve Shopping. The huge Leroy Merlin DIY store and that of Sportdirect.com are across the road. The cinema at Algarve Shopping has programmes daily from around 1400hrs, details here - all films made in English are shown in English except some children's cartoons etc. VP in the programme list indicates where a film is in Portuguese, VO in the original. If there's nothing, it will be in English or the original language (French, Chinese etc) if not. These locations are about four miles (6km) out of town on the N125, about a mile (1.6km) east of the village of Guia. They are not well served by bus. The only buses are those from the Bus Station to Lagos (Transrápido and Albufeira - Lagos) and those to Portimão via Guia. Times below, but in all honesty unless you are fairly brave a taxi is probably the best way. There is a taxi rank at the Mall for the ride back. Taxi fare is about 8 or 9 Euros, depending on where in Albufeira you are coming from/going to. There is also a free bus on weekdays from some parts of Albufeira - see below. 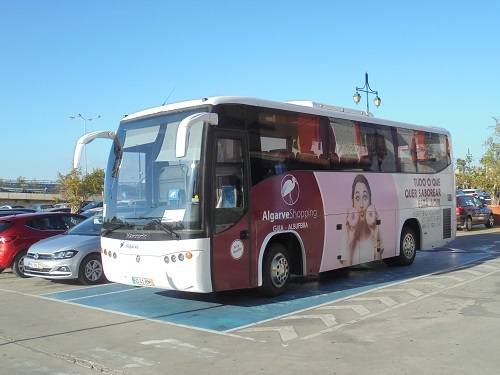 Local buses also run between Alcantarilha, Armação de Pera, Porches, Lagoa and Algarve Shopping - times here. There is no bus from Ferreiras. The village of Guia is served by buses from Páteo, Algoz and Messines but that leaves you a mile (1.6km) walk (uphill) to the Mall along a very busy road with no proper footpaths. There are NO BUSES between Albufeira Old Town area or the 'strip' area and Algarve Shopping. All buses leave from the main bus station and most stop nowhere else. Buses highlighted run non-stop from Albufeira Bus Station to Algarve Shopping. The other buses also stop at the Health Centre (bottom of the hill near Eden Resort) about 2 minutes after leaving the bus terminal and at Albufeira Camping about five minutes after leaving the Bus Station. Fare is €3,35 on the non-stop buses, €2,35 on the others. Saturdays, Sundays and holidays: 0840, 0910, 0940,1030, 1150, 1325, 1405 (Saturdays only), 1415, 1600, 1800, 1820, 1910. When you get off these buses there is a very busy road to cross. Use the bridge, even though this means an extra 200 metres to walk. Bus Times Algarve Shopping back to Albufeira - buses highlighted run non-stop to Albufeira Bus Station. The others stop at Albufeira Camping and the Health Centre. The stop for return journeys is directly opposite where you got off. WARNING - ON ANY DAY THE AFTERNOON AND EVENING BUSES FROM ALGARVE SHOPPING TOWARDS ALBUFEIRA ARE ROUTINELY 10 - 15 MINUTES BEHIND SCHEDULE OWING TO TRAFFIC CONGESTION. There is a free bus between mid March and mid October from certain hotels out to Algarve Shopping. To see this year's timetable larger size click here. It will open in a new window. For a printable copy please click here. The bus used has 40 seats. Seats cannot be reserved - it is first come, first served. Buses either stop at the 'hotel entrance' or at a nearby bus stop. Check if not sure. The Albufeira Bull Ring (Praça do Toiros) is in Areias São João. The GIRO 2 Red, blue and green routes pass nearby. Also stopping outside are the buses to/from Vilamoura etc but these do not run in the late evenings for any possible trip back to your hotel. Licensed taxis in Albufeira are painted either beige or green and black. There is just one number to call if you need a taxi at your hotel or other lodgings - 289 583 230. You can't reserve in advance, just call a few minutes before you need to leave or use the 'app' you can download from the official website here. Base fare is €3,25 for the first three kilometres, then it's 90 cents per kilometer afterwards. Fares (including base fare) are 20% higher after 10pm, at weekends and on public holidays. Baggage is €1,60 extra. If you phone for a taxi, that's 80 cents extra. You can try to hail a taxi in the street, but 99% of the time they are already on a call so will not stop. If you are in the old town centre or other tourist hotspots, you must go to a taxi rank. Be warned that in high summer queues can be VERY long; half hour waits are not unknown. You may find the GIRO bus, tourist train or walking a better choice! Outside the peak season the drivers will bite off your hand for a fare. For some sample fares between the centre of Albufeira and various locations near and far, take a look at the official notice copied here. This will open in a new window. There is also the official Taxis Albufeira website you may wish to consult here. Uber vehicles are available in summer, in fact many drivers are 'imported' from other parts of the country. They don't know where anywhere is, so be sure you do! And this might sound stupid, but do make a note of the address at which you are staying and have it on a bit of paper to show the driver if need be. I have heard tales of people forgetting where they are supposed to be going back to, especially after a good night out! It's 'a big white hotel' will not help much. There is nothing official, but there is free parking next to the main bus station. Visitors parking there have easy access to all local buses on the GIRO network.